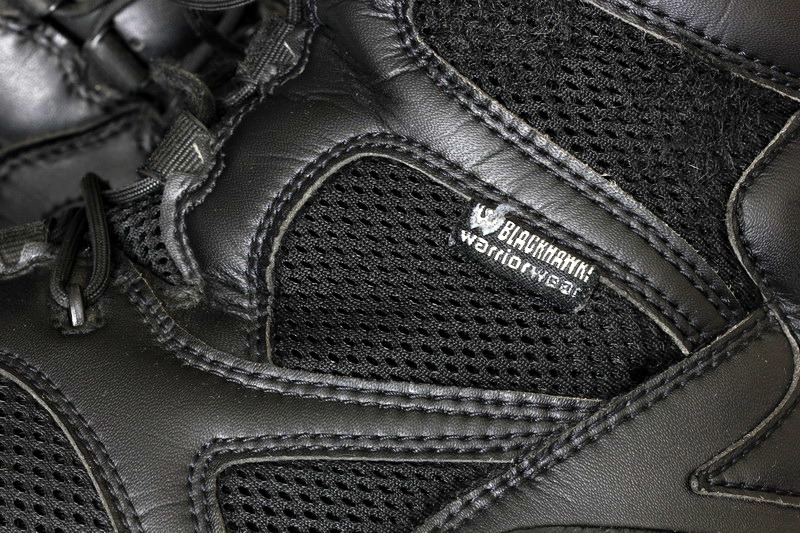 Per the Blackhawk website these boots "are ideal for waterborne operations or hot-weather ops" which may give the wrong impression about them. 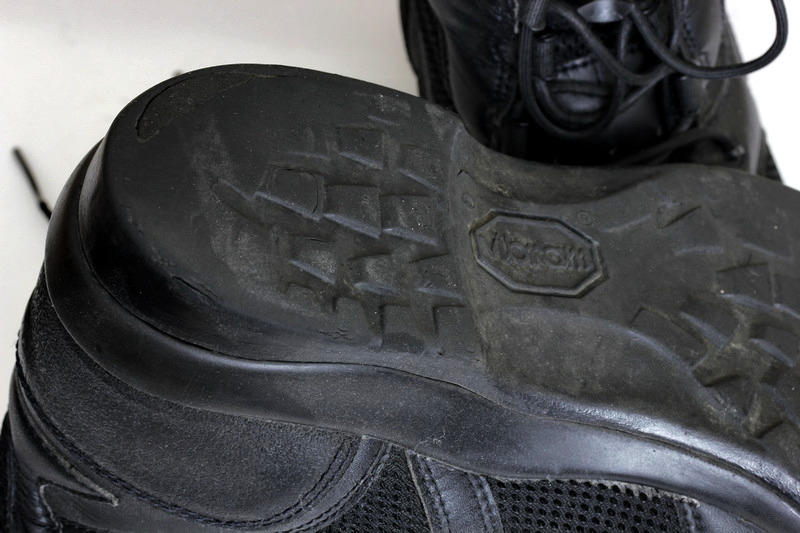 The boots are mid height and are partially leather and have front/rear "grip" or abrasive leather type material, which is good for force related applications. 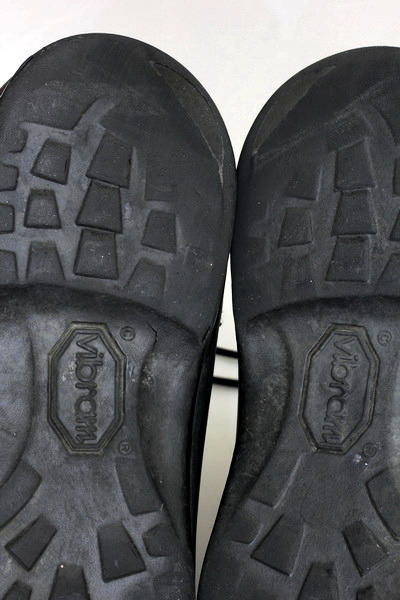 The boots have ventilated fabric throughout the body, which help towards their water-based use description. I bought these boots from AtlanticTactical and they were $180 when I bought them in 2010, standard width (they come in two types, wide and medium). I wear a 10.5 in every type of shoe/boot/footwear except this boot. For some reason I needed a smaller size, 10. 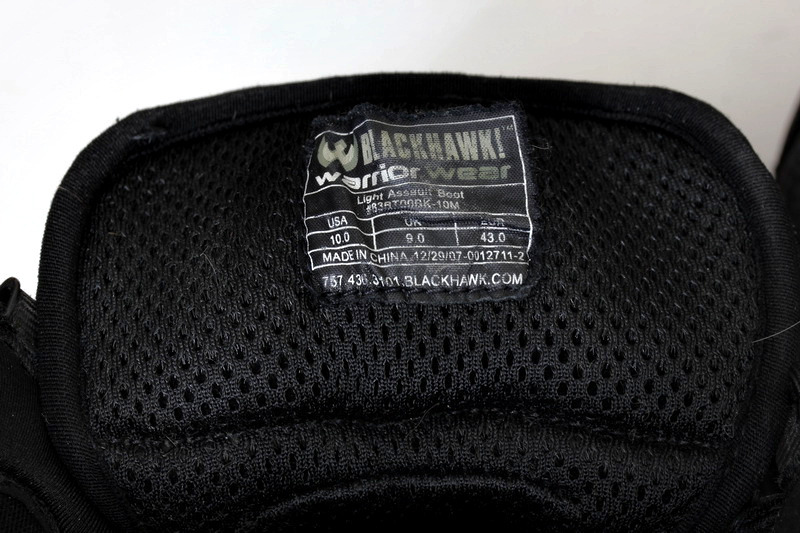 These boots were made in China per the Blackhawk website. The boots I had before were too bulky and I needed to get a smaller, slimmer boot I could run in, which if drowned in water would dry quickly, since I bought them in December of 2010. That and the boots I was wearing before wore out very quickly and since I wear them on duty daily I needed a versatile pair of boots. For me, there were two motivating factors in purchasing these boots, aside from the fact that no one introduced me to Salomon XA Pro 3D Mid GTX Ultra's yet (since Salomon's are all I wear now), I'll be reviewing them in a few months since I want to put some wear time in them before I review. First, I needed to be able to run in the boots. 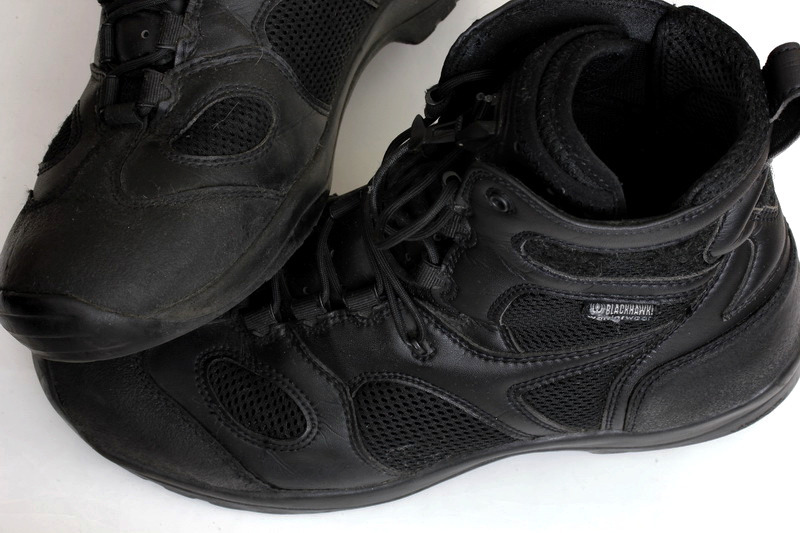 Some boots are very "sole" heavy, or front heavy causing you to stomp when you run, I needed boots that were more like sneakers and had a slimmer profile, which these did. Secondly, I knew I was going to wear these boots through the winter into the summer and if they made it a year at that point I would wear them again through the second winter, these boots felt like they could manage that. I was trying boots on and I put them up against some 5.11 boots and others, at the time these stood out to me as having better quality. Looking back I probably should have taken more time to do some research but these boots were "new" at that time and a review like this was not going to be around for me to read. The only "modification" I did when I brought these boots to work was to give them a shine, using Kiwi Polish and off to the rodeo I went. As all new-to-you footwear goes, there is a break in period. I did not feel the typical discomfort you feel when you put on a pair of $50 Nike's, just the typical "getting used to" period, which after the 8 hour shift I work passed I was pretty content with the boot. 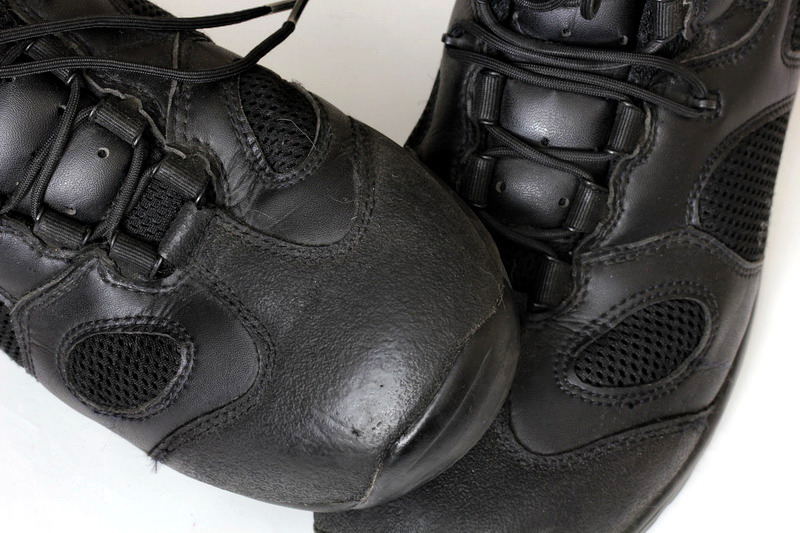 The most obvious difference, to me, from the other boots I have owned before and these was how the laces were retained and how ventilated the boots were. 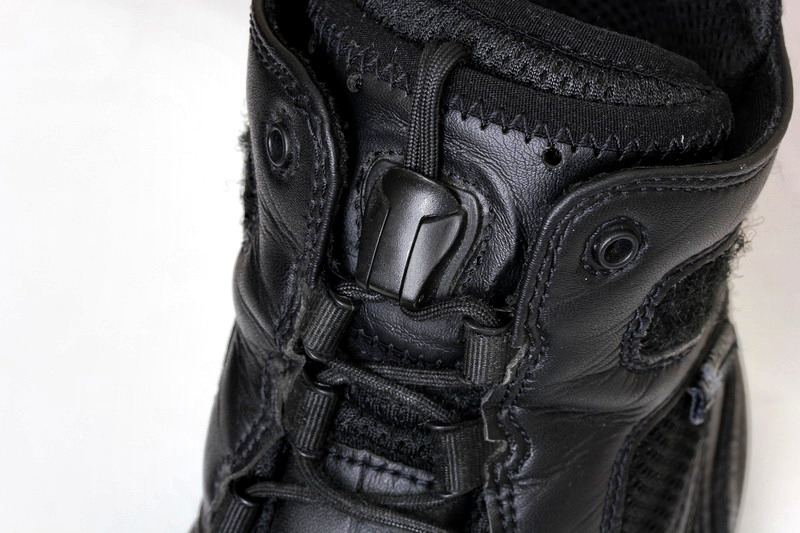 I pulled the laces up, tightened the clasp and shoved the remaining laces into the pocket at the top of the tongue (front part of the boot) and they were retained without issue. The ventilation was very important to me since I was in and out of vehicles, homes and in the outdoors constantly. My feet need to get air to breath and need to have the ability of getting head on them to dry or warm up during the winter and in the warm weather. Two days after I started wearing these boots at work I had to do some running and ended up stepping into a puddle of icy water. My socks became very wet almost instantly since they soak up water (heavy wool socks for the winter). After I concluding the little foot chase, I was able to get back into my vehicle and turn the heat on the floorboard to equator level. My feet were dry in under 10 minutes. I have had my feet get wet inside other boots before and I would have to remove the boot in order to dry my feet, obviously this was not the case because of the ventilation these boots have. The boots continued to hold up well throughout the winter, I did some snow running a few times, and they did soak through, which was to be expected, but dried very quickly after under heat from a vehicle. I would not suggest buying these with any type of winter-specific activities in mind. 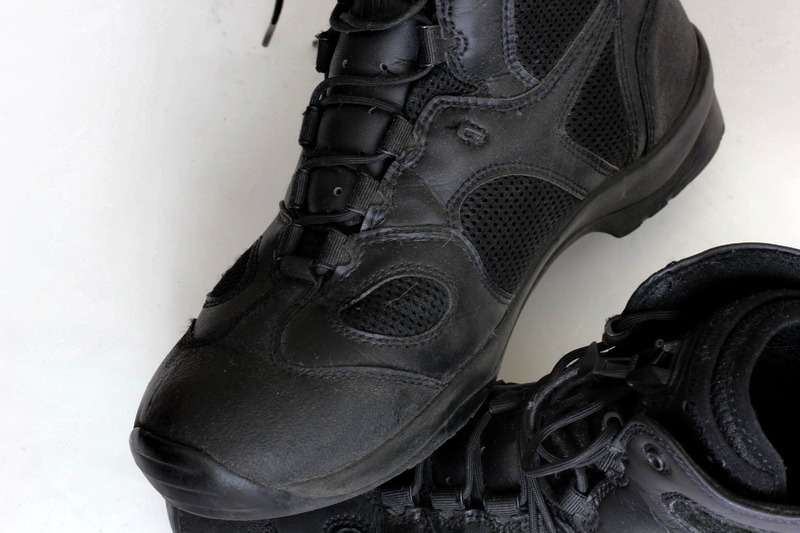 If you want to do something like GoRuck then these boots would serve you very well since you may be in water and out several times, which is what these boots were specifically designed for. The boots kept up with me throughout my daily activities, which were very difficult at times and demanded a lot from my equipment. I hard use my equipment and except it to keep up with me. These boots did for the most part. 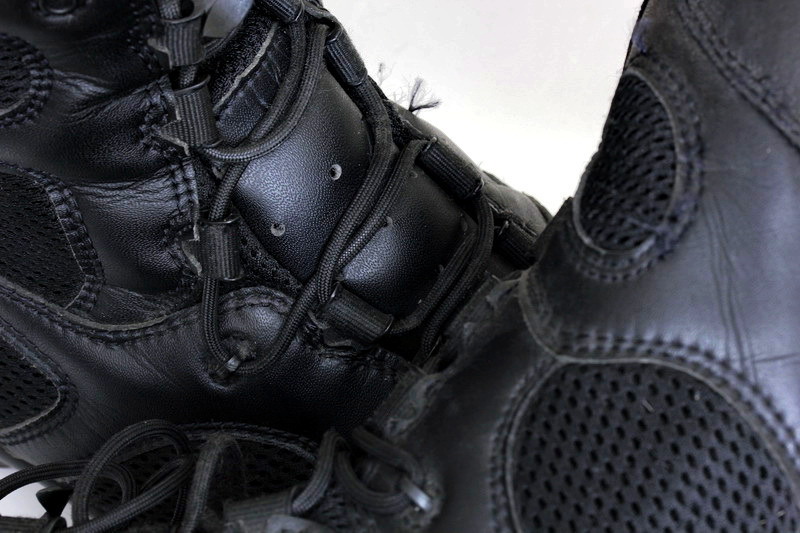 After six months of wearing them I found that one of the lace-stays had ripped out of the boot (picture below). No big deal really, its a plastic piece that was not glued in correctly, I expected issues from a product that was made in China, no matter how tactical it looks. It did not impede the function of the boots or laces in any manner. The rough texture toe of the boot did not like to take a shine or keep it for any amount of time. I had to polish it up daily, often times, in order for them to look presentable, since having unpolished duty boots is completely unacceptable. The toe held up very well throughout the life of these boots. Total ankle support and comfort was very high in the first year of wearing these boots. As with all footwear there is a shelf life. Even the high-end running sneakers, like the NB 880v2 that I recently purchased, have a total amount of miles you can put on them before they wear in certain parts that limit their functionality. 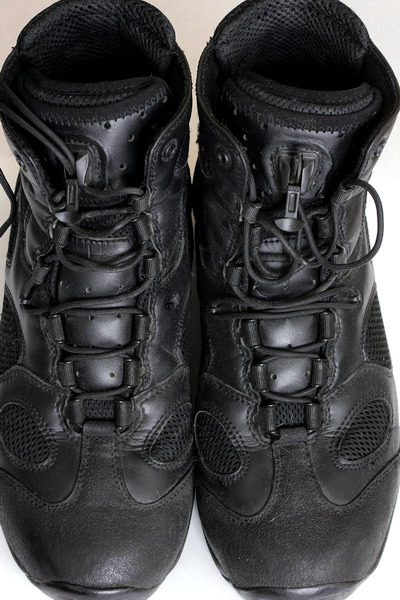 While I did not count the amount of miles I wore these boots, I wore them daily on duty for about 16 or so months. I could slowly start to feel the arch support start to give way and my heel started to hurt. Since I, like many of you, do not look at the heel of your footwear on a daily basis I missed its development. After seeing the rubber on the Vibram labeled rubber wear to the point the secondary layer was showing I decided to get a summer shoe (since it was summer at that point) and put these in a box so I can figure out what I want to do with them. These boots could not be worn without high running high socks, I wore 5.11 heavy socks with these boots because the inside of the top neck of the boot has the same abrasive material that the toe and rear of the boot have. So that on bare skin is not something even remotely comfortable. If you want to wear boots with ankle socks or some sort of skinny/dress sock, these are definitely not the boots for you. As I wore the boots over the span of their life on my feet there were comfortable and the only time it changed was towards the end when the heel wore out. The boots did exactly what they were designed to do, which was have ventilation for fast drying. 16 months is slightly more than I thought they would last but I kept wearing them as long as my feet/knees did not hurt. The ventilation material/fabric eventually started to rip and fray here and there. Maybe it was just getting the best of being use and abused for so long, but the boot did start to get close to falling apart. I am sure if I were to wear them for another two or three months, aside from the pain I would have from the lack of support I am sure they would be in pieces. 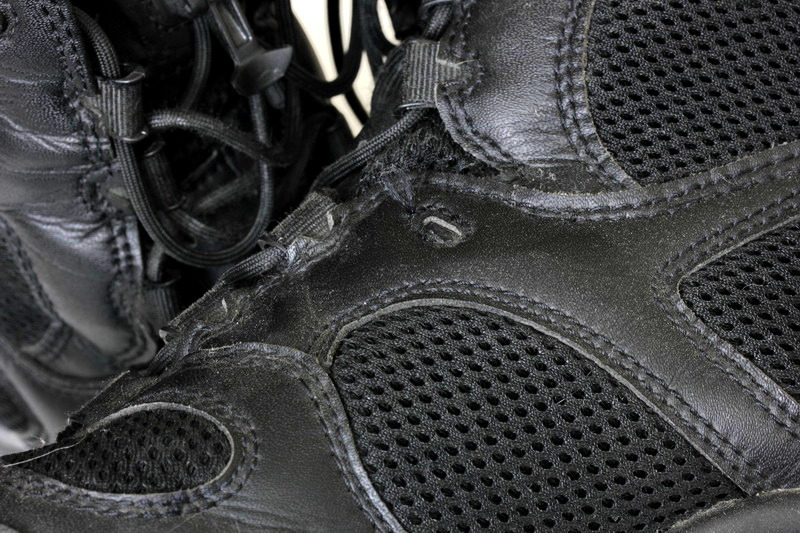 If you are looking for a specialty boot, that is ventilated and that can be used for wet climate operations, then this is definitely for you. I would not recommend buying this boot because you want a comfortable boot to walk in, or if you want a comfortable boot to work on your feet in. The only reason this boot was awesome on my feet because I was in a vehicle for more than 50% of the time I wore them. I did some running, some walking, some climbing and a few others things in these boots that are probably not recommended for the average person, but they held up. I, personally, did not find them comfortable to walk in, ever. I could run all day in them, but walking, not in these. Since we always have 20/20 hindsight, looking back I should have done some more research and taken the time to find other brands which competed with Blackhawk for my money. I just went with what was in front of me at that moment, fool me once. As I said earlier I am wearing a pair of Salomon boots now, and they are beyond awesome. A review will be coming soon of the Salomon Speedcross 2 GTX. Anyway, if anyone wants these boots, shoot me an email and we will see about me getting them to you, since I am just going to throw them in the trash.